A Hot, Active, Noise Reducing Antenna System that will sit on your desk and copy 2200, 1700, and 600 through 160 Meter Experimental and Amateur Radio Signals! National RF’s Type NLF-2 low frequency active antenna and amplifier was designed specifically for the reception of experimental radio stations in the 2200 meter band (135 KHz -137 KHz), the 1700 meter band (160 KHz – 190 KHz), the 600 meter band (500KHz –510 KHz), and the standard 160 meter (1800 KHz – 2000KHz) amateur bands. The system consists of two separate long ferrite rod tunable antennas which plug into an antenna coupler unit. The coupler unit also has provisions to interface a separate external antenna that may be used as a sense antenna to give additional directivity characteristics and noise rejection. However, the external antenna is not needed, as the ferrite rod antenna is a stand-alone subsystem. The coupler unit interfaces with a separate electronics enclosure that houses the electronics. This includes the main tuning capacitor, a balanced FET loop amplifier and a controllable gain output amplifier. The unit is designed to feed virtually any receiver capable of receiving these low frequencies, and will drive 50 ohm to about 300 ohm receivers inputs without compromise. In addition to the front panel amplifier gain control, a separate receiver drive control (attenuator) is provided for receivers already with sufficient front-end gain and AGC systems that may not be disabled. The Type A and Type B antenna plug-in assemblies house a 15 inch long ferrite rod antenna that are designed to cover two specific low frequency bands, respectively. Each plug in unit allows the rod portion to rotate 180 degrees, thus allowing the user to adjust the direction of the antenna for noise rejection, or signal enhancement, as required. The antenna and coupler assembly may be operated on any tabletop or flat surface, such as a desk. Interface with the tuning and amplifying unit is done with patch cords. Power is provided by a single 9 volt battery mounted on the rear panel. Two UHF female connectors are provided. One may be connected to an existing HF antenna and the other interfaces to the receiver. When the Type NLF-2 is off, the HF antenna is automatically connected to the receiver. When the unit is activated, the HF antenna is disconnected and only signals from the low frequency loop are sent to the receiver. Thus, the tuning and amplifying unit may be permanently placed on a shelf and switched in or out as required. Note; when used with transceivers, we recommend that the Type NLF-2 be used only for receiving and not transmitting. Due to the size and power rating of the switching network, excessive RF power may damage the unit as well as possibly alter the through-put SWR of the station’s antenna feedline. National RF will manufacture custom ULF/VLF/LF plug-in units for the Type NLF-2 system that will allow reception as low as about 10 KHz and as high as 500 KHz. A quotation will be given upon request for these plug-in assemblies. The reception of LF, VLF and ULF radio signals normally requires exceptionally long wire antennas due to the extremely long wavelengths of the signal. In addition, both man-made and naturally occurring noise is more than abundant at these extreme wavelengths. Standard household devices, such as light dimmers, coffee pot controllers, computers and their power supplies, remote control devices, and florescent lighting, emit spurious and always unwanted noise and signals. These signals will propagate several hundred yards, and the conventional urban neighborhood is an anathema of noise to the low frequency listener. Therefore, some noise reduction is a welcomed addition to the receiving installation. Although the ferrite rod antennas, will not get rid of the noise, they do offer two nulls on either axis that may be put to good use when trying to receive legitimate radio signals at these frequencies. The Type A and Type B antenna plug-in assemblies provide 180 degree rotation of the antenna rod, thus allowing the user to adjust the direction of the antenna so that minimum noise is received. In addition, instead of requiring thousands of feet of wire, the units resonate to the desired frequency with a total length of about 16 inches of length. Furthermore, if the user does have a vertical antenna that is of sufficient length, or electrically loaded to the low frequencies, it may be used with the ferrite rod assemblies as a “sense” antenna. When properly coupled into the assembly, and assuming the external sense antenna can provide sufficient signal voltage to the coupler, the ferrite rod antenna can be adjusted for unidirectional characteristics. 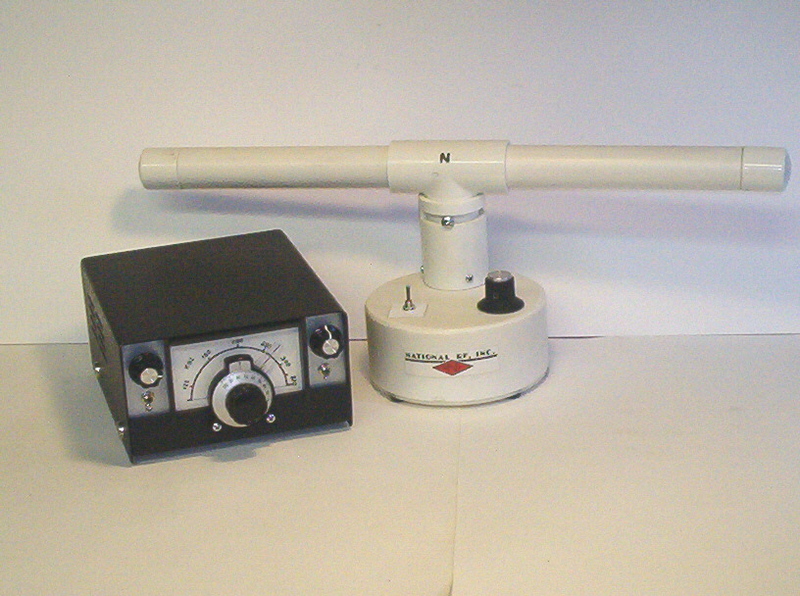 Under these conditions, a single deep null off one side of the rod will be achieved and can be used for noise cancellation, or signal enhancement. A separate control is provided on the coupler unit to control the injection level of the external input, as well as a switch that totally isolates the external antenna. Mechanically the same as A and B. Frequency range to be determined by customer. A note to our Amateur Radio customers…..we know this is not a small amount for this hardware. However, the 15 inches of ferrite material and the 1500 pf variable capacitor used in the antenna assemblies are not “cheap stuff!! !” You will be getting a quality system that has had a substantial amount of engineering put into it, plus quality built into it. If you are not satisfied with this hardware, as with all of our hardware, we will refund you money, less the shipping charge. Overseas Customers: Please note that additional overseas shipping charges will be applied to your order. National RF will notify you of the exact amount of shipping to your country via e-mail, after your e-order is placed. The customer is responsible for all and any customs or tariff charges applied to your order as well.